Silicon photonics market is expected to show a remarkable growth in the next 5 years. The factors driving the growth of this market include price, capability, and size. As the price of silicon photonics technology is constantly falling, its demand is extensively increasing in all the verticals including healthcare, telecommunication and defense among others. Over the years, major players are showing their interest in silicon photonics market. Players like Intel Corporation, Cisco Systems, Inc., IBM Corporation and Juniper Networks, Inc. among others are investing extensively in silicon photonics market in order to improvise their products as well as to capture a major market share. However, even with such enormous growth, silicon photonics market is facing a lot of challenges such as problems in adopting different communication systems, risk of thermal effects and lack of commercialization in telecommunication sector. Silicon photonics market is lined up with a handful of opportunities in the coming future. Developed economies are heading up with the upcoming projects on smart cities. Moreover, with the growing awareness towards health, various technological advancements have already been initiated in the healthcare sector which will increase the demand for this technology in healthcare segment. The U.S. generated the maximum amount of revenue in the year 2015 in the global silicon photonics industry as compared to the other countries, whereas India is expected to have the maximum potential to grow in the forecast period. The U.S has always been on the forefront of the world map when it comes to technological advancement. While profiling major companies, it has been found that most of the renowned companies are US based, giving significant impetus to the growth of this market in the US as well as the whole of North America. In terms of market value, the optical waveguides dominated the global silicon photonics market in 2015, with a total market share of 45.4%, and is expected to reach at a significant rate by the end of 2022 registering a CAGR of 21.69% over the forecast period. In terms of product segment, transceivers market held the highest share in 2015 and continues to be on the top in the forecast period as well. Optical cables, multiplexers and attenuators, show a sharp downfall in terms of share in silicon photonics product market. Verilink Corporation, Pandatel AG, Moog Inc., TC Communication, Inc are some of the manufacturers as well as suppliers of optical Multiplexers. Wakefield acoustics and Allaway acoustics are some of the manufacturers of attenuators. In the application segment, data communication is growing at the highest CAGR in the forecast period followed by telecommunication and healthcare. 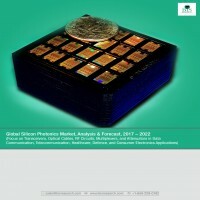 The report answers the following questions about the global silicon photonics market. • What are the different types of products using silicon photonics technology? • What are the different types of components used in silicon photonics technology? • What are the different application areas of the global silicon photonics market? • What are the different factors driving the global silicon photonics market forward in the forecast period? • What are the factors challenging the growth of the global silicon photonics market? • Who are the leading players in the global silicon photonics market? • What kind of new strategies are being adopted by the existing market players to make a stronger mark in the industry? • Which region will be the leader in the global silicon photonics market? • Which country will be the leader in the global silicon photonics market? 8.7 Huawei Technologies Co. Ltd.
Silicon photonics is an emerging technology which is designed to deal with the problem of huge amount of data. This is possible through high density photonics integration with photonic devices. Moreover, these integrated photonics works closely with energy efficient network operation. Silicon photonics is the perfect solution for such high density photonic integration which allows incorporation of photonic devices made of silicon on a silicon wafer. Silicon photonics is translucent and has a refractive index in the range of 1200-1700 nm telecommunication wavelength. Thus, it is used to build very dense photonic devices. Since, silicon is a semiconductor, it is helpful in performing various functions such as optical modulation. Silicon based devices are highly reliable and are capable of producing mass production at much cheaper rate. Silicon photonics market is expected to show a remarkable growth in the next 5 years. The factors driving the growth of this market include price, capability, and size. As the price of silicon photonics technology is showing a constant downfall, its demand has been extensively increasing in all the verticals including healthcare, telecommunication and defense among others. Over the years, major players are showing interest in silicon photonics market. Players like Intel Corporation, Cisco Systems, Inc., IBM Corporation and Juniper Networks, Inc. among others are investing to a large extent in silicon photonics market in order to improvise their products as well as to capture a major market share. However, even with such enormous growth, silicon photonics market is facing a lot of challenges such as problems in adopting different communication systems, risk of thermal effects and lack of commercialization in telecommunication sector. Silicon photonics market is lined up with a handful of opportunities in the coming future. Developed economies are heading up with the upcoming projects on smart cities. Moreover, with the growing awareness towards health, various technological advancements have already been initiated in the healthcare sector which will increase the demand for this technology in healthcare segment. The global silicon photonics market was estimated at $492.18 million in 2015, and is expected to grow at a rapid pace of 20.34% over the forecast period 2016-2022 to reach $1,676.10million by 2022. The growth in silicon photonics market over the period 2016-2022 is expected to be primarily supplemented by factors such as increasing demand for huge data transfer; rising demand for higher bandwidth and increasing support by government for adoption of silicon photonics technology. Furthermore, the future of the silicon photonics market is expected to be favorable on account of impelling demand due to research and development activities being carried out in companies, expanding internet connectivity along with rising rate of mobile adoption. In terms of market value, the optical waveguides dominated the global silicon photonics market in 2015, with a market share of 45.4% of the total market, and is expected to reach at a significant rate by the end of 2022 registering a CAGR of 21.69% over the forecast period. In terms of product segment, transceivers market held the highest share in 2015 and continues to be on the top in the forecast period as well. Optical cables, multiplexers and attenuators, show a sharp downfall in terms of share in silicon photonics product market. Verilink Corporation, Pandatel AG, Moog Inc., TC Communication, Inc are some of the manufacturers as well as suppliers of optical Multiplexers. Wakefield acoustics and Allaway acoustics are some of the manufacturers of attenuators. In the application segment, data communication is growing at the highest CAGR in the forecast period followed by telecommunication and healthcare. The market is dominated by North America and Europe which hold 70% of the total market share. Asia pacific is expected to grow at the highest rate in the forecast period. The dominance of North America in the silicon photonics market over other regions is due to heavy demand for new construction, strong economic growth driven mainly by China, and increasing affordability of silicon in the region. The US is the leader of the North American silicon photonics market, and it accounted for a market share of around 63.6% in 2015.